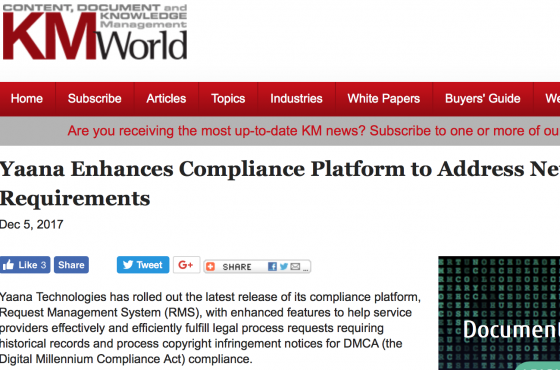 SAN JOSE, CALIFORNIA – December 5, 2017 – KMWorld, the leading publisher, conference organizer, and information provider serving the knowledge management, content management and document management markets, recently featured Yaana’s latest Request Management System (RMS) in their online publication. 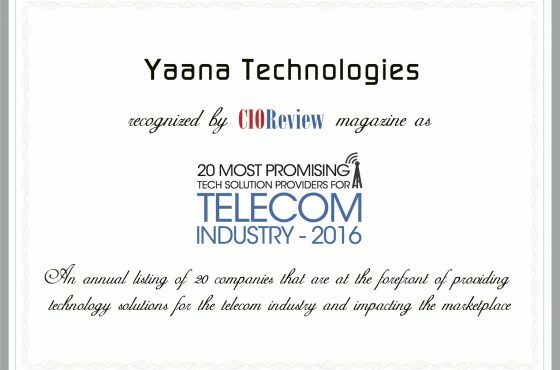 FREMONT, CA — July 14, 2016 — Yaana, a leading global provider of a wide range of intelligent compliance solutions, has been selected as one of the 20 Most Promising Tech Solution Providers for Telecom Industry 2016 by CIOReview. See below for full story and article in the July 2016 edition of CIOReview. FREMONT, CA — July 14, 2016 — Yaana, a leading global provider of a wide range of intelligent compliance solutions, has been selected as one of the 20 Most Promising Tech Solution Providers for Telecom Industry 2016 by CIOReview. Yaana is recognized by CIOReview based on its specialties in network security, communications network, mobile data retention and managed services. It offers intelligent compliance solutions including lawful interception, accurate data retention, big-data search & disclosure, advanced security and application specific analytics. Yaana provides powerful innovative products and services incorporating advanced security measures that exceed industry best practices. Its Mobile Investigation & Data Acquisition System (MIDAS) application helps to communicate in real-time saving time, money and resources. Its Law Enforcement Agency Data System helps communications provider to quickly look up through the number and identify the correct owner of the account. It is an expertise in leading global industry standards and regulatory issues around legal compliance, legal interception, cyber security and data retention. SAN JOSE, CALIFORNIA – May 31, 2018 – CSG (NASDAQ: CSGS), the trusted partner to simplify the complexity of business transformation in the digital age, has partnered with Yaana to advance GCI’s ability to respond quickly and accurately to notifications alleging copyright infringement by GCI’s subscribers. GCI offers wireless and wireline voice, video, and data communication services to residential, commercial and government customers across Alaska and the Pacific Northwest. CSG has partnered with Yaana, a leading global provider of intelligent compliance solutions, to deliver a copyright complaint system that quickly and accurately processes copyright infringement notices from digital content owners and their copyright agents to GCI’s Internet subscribers. The system enables GCI to rapidly notify and educate its customers regarding copyright infringement and take other appropriate measures. CSG’s managed services offering combined with Yaana’s copyright complaint system offers a cost-effective solution that automates the process of managing incoming notices alleging copyright infringement. CSG is an authorized reseller of several Yaana solutions, including legal compliance solutions such as Request Management System (RMS) and Data Retention System (DRS). “Our strategic partnership with CSG allows us to effectively address the challenge regarding copyright infringement by extending our copyright complaint solution to communication providers. We are proud that GCI has chosen Yaana’s industry leading copyright complaint system,” said Raj Puri, chief executive officer of Yaana. Yaana is a leading global provider of Intelligent Compliance Solutions including compliance request management systems, data retention and analytics systems, lawful interception systems and a variety of cybersecurity mediation systems. Yaana solutions offer customers a cost-effective path to address the complexities related to meeting compliance needs in the rapidly evolving information communications and cloud markets worldwide. For more information, visit our website at yaana.com and follow us on LinkedIn, Twitter and Facebook. SAN JOSE, CALIFORNIA – December 5, 2017 – Complying with Law Enforcement and other discovery demands is very complex and increasingly expensive for Service Providers. Today, Yaana Technologies released the next generation of their industry leading compliance platform, Request Management System (RMS), with enhanced features to help Service Providers effectively and efficiently fulfill legal process requests requiring historical records and process copyright infringement notices for DMCA (Digital Millennium Compliance Act) compliance, resulting in improved resource allocation and reduced costs. SAN JOSE, CALIFORNIA – December 5, 2017 – Complying with Law Enforcement and other discovery demands is very complex and increasingly expensive for Service Providers. Protecting the privacy and security of subscribers’ data is a critical priority with potential consequences for Telecommunication Service Providers, Wireless Service Providers, Cable MSOs, Internet Service Providers and Social Media companies. Today, Yaana Technologies released the next generation of their industry leading compliance platform, Request Management System (RMS), with enhanced features to help Service Providers effectively and efficiently fulfill legal process requests requiring historical records and process copyright infringement notices for DMCA (Digital Millennium Compliance Act) compliance, resulting in improved resource allocation and reduced costs. Available as an on-premise solution or as a fully-managed service (Yaana NetDiscovery Compliance Service™), RMS provides a highly secure and scalable platform that supports processing and retaining lawful interception and record production requests with real-time provisioning, processing DMCA copyright infringement notices for subscriber copyright violations, as well as many other compliance use cases. With the latest release, users can request sender verification through a compliance portal, easily manage multiple triage steps with a central inbox for all records production requests and copyright infringement notices, and experience an intuitive user interface with streamlined user flows. Users can quickly access volume and team performance trend charts and KPIs in the newly designed home page. RMS platform seamlessly integrates with any of the provider’s existing data repositories or data lakes. Yaana also offers a fully integrated Data Retention System (DRS) with RMS and can be configured based on the type(s) of legal compliance that is desired. Yaana Technologies (www.yaanatech.com) is a leading global provider of Intelligent Compliance Solutions including compliance request management systems, data retention and analytics systems, lawful interception systems and a variety of cybersecurity mediation systems. Yaana’s solutions offer our customers a cost-effective path to address the complexities related to meeting compliance needs in the rapidly evolving information communications and cloud markets worldwide. SAN JOSE, CALIFORNIA – September 12, 2017 – Yaana Technologies collaborated with NCMEC in developing and implementing a Team Adam MIDAS version to assist with the efforts of Team Adam to support law enforcement. SAN JOSE, CALIFORNIA – September 12, 2017 – According to the FBI’s National Crime Information Center Missing Person File, juveniles under the age of 18 account for 38.3% of missing persons in 2016. The National Center for Missing & Exploited Children® (NCMEC), a nonprofit dedicated to helping find missing children and stop child sexual exploitation, provides on-site assistance to law enforcement agencies and families in cases of missing children through its Team Adam program. Team Adam consultants are retired law enforcement professionals with years of experience at the federal, state and local levels. Consultants from Team Adam provide on-the-ground technical assistance and connect local law enforcement to a national network of resources. Yaana Technologies collaborated with NCMEC in developing and implementing a Team Adam MIDAS version to assist with the efforts of Team Adam to support law enforcement. “We at NCMEC appreciate the dedication and passion that Yaana has shown in developing and deploying this application to support our mission of bringing missing children home safely. This mobile app has quickly become a very valuable asset.” Mark D. Gianturco, Vice President Technology Division of CTO Office, NCMEC. 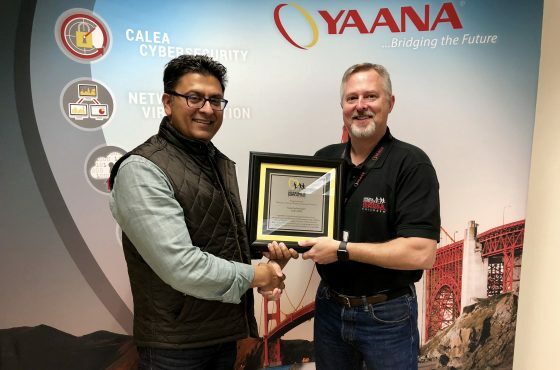 **UPDATE** – February 2018 – Mr. Mark Gianturco with the National Center for Missing and Exploited Children (NCMEC) came by recently to present Yaana with a plaque in recognition of their appreciation for Yaana developing and implementing a version of MIDAS for Team Adam to support law enforcement. This is tangible evidence of Yaana’s efforts and the huge impact the company has made on making the world a safer place. Yaana continues to support NCMEC in maintaining and updating MIDAS for Team Adam so their consultants can continue to rapidly investigate missing persons and other crimes and bring missing children home safely. The National Center for Missing & Exploited Children® is the leading private, nonprofit organization helping to find missing children, reduce child sexual exploitation and prevent future victimization. NCMEC has assisted in the recovery of more than 243,000 missing children and received more than 20 million reports of suspected child sexual exploitation on its CyberTipline. To learn more about NCMEC, visit http://www.missingkids.org/home or follow NCMEC on Twitter and Facebook. Yaana Technologies (www.yaanatech.com) is a leading global provider of Intelligent Compliance Solutions including compliance request management systems, data retention and analytics systems, lawful interception systems and a variety of cybersecurity mediation systems. Yaana’s solutions offer customers a cost-effective path to address the complexities related to meeting compliance needs in the rapidly evolving information communications and cloud markets worldwide. SAN JOSE, CALIFORNIA – May 17, 2017 – Yaana Technologies, the leading global provider of intelligent compliance and security solutions, announced the appointment of Jeffrey Zellmer as its new Chief Financial Officer. 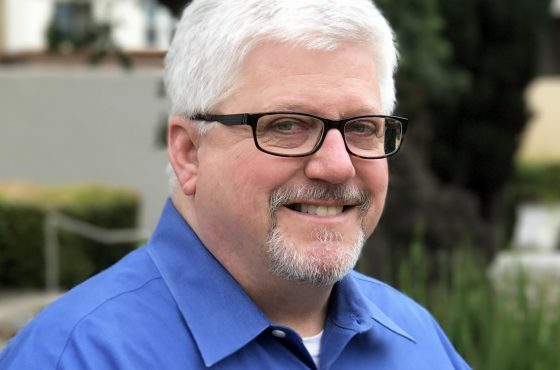 Reporting to Raj Puri, CEO, and based in the company’s headquarters in Silicon Valley, Jeff Zellmer will oversee corporate finance, accounting, human resources and general administration at Yaana Technologies. Jeff brings with him an extensive experience in corporate governance, financial planning and analysis, and strategic planning, along with a deep appreciation for Yaana and its unique position as a leading global provider of intelligent compliance solutions with trusted data retention, sophisticated security, and unique analytical capabilities. “We are very happy to have Jeff Zellmer on board as our CFO. Jeff’s appointment as the CFO underscores Yaana’s next phase of its global growth with its strong commitment to the compliance and security complexities of the emerging markets worldwide. With Jeff’s acumen and vast experience, I’m confident we are well positioned to meet our growth strategies and goals,” said Raj Puri, CEO of Yaana Technologies. Jeff is a veteran financial executive with a proven track record leading global, publicly traded technology companies in both high growth and turnaround situations. He has held the position of CFO in multiple public and private companies, including MetricStream, Dental Technologies and Silicon Graphics, where he has demonstrated results of stellar corporate governance and building strong finance organizations that are tightly integrated with the business. To date, Jeff has completed over $500M in equity and debt financing transactions. Jeff holds a B.S. in Finance from San Diego State University, has completed graduate course work for an M.S. in Finance and the Stanford University Director’s College on Corporate Governance. SAN JOSE, CALIFORNIA – May 9, 2017 – Complying with the Digital Millennium Copyright Act can be resource intensive and is becoming increasingly expensive for Internet Service Providers as a result of rising copyright violations by their subscribers and consequent notices that are received from content owners and their copyright agents. Today, Yaana Technologies announced its launch of DMCA Infringement Management Solution, to help Internet Service Providers efficiently processes copyright infringement notices in seconds – reducing operational costs while ensuring compliance. SAN JOSE, CALIFORNIA – May 9, 2017 – Complying with the Digital Millennium Copyright Act can be resource intensive and is becoming increasingly expensive for Internet Service Providers as a result of rising copyright violations by their subscribers and consequent notices that are received from content owners and their copyright agents. Today, Yaana Technologies announced its launch of DMCA Infringement Management Solution to help Internet Service Providers efficiently process copyright infringement notices in seconds – reducing operational costs while ensuring compliance. DMCA Infringement Management Solution is available both as a fully managed service and through customer premise implementation. The Safe Harbor provisions contained in Section 512 of the DMCA can help shield Internet Service Providers from liability for copyright violations of their subscribers and for provision of links to copyright protected material available from other Internet sources. However, these provisions depend on the Internet Service Provider’s policies for notifying their infringing subscribers and escalated action plan dealing with repeat offenders; failing to be proactive against copyright infringement may result in civil litigation and significant fines. Automatically process large volumes of DMCA notifications and provide customizable escalation workflow to manage repeat infringers. Help reduce copyright infringement over your network by tiered notifications and responses. Utilize scalable infrastructure to handle rising subscriber copyright violations and retain DHCP logs while ensuring privacy for all sent and received notifications. Provide insight from data analytics with real-time visualization, scheduled and customized reports. Respond efficiently and securely to infringement notices from content owners and their agents. Automatically process large volumes of DMCA notices while managing repeat infringers with escalation workflows and subscriber IP address mapping for manual intervention. Maintain compliance with a built-in tiered notification and response system aimed at reducing copyright infringement over your network. Customize workflows and rules engine with configurable role and permission based visibility to adapt to each Service Provider’s unique requirements. Yaana Technologies, LLC Acquires IP Fabrics, Inc.
Yaana acquired Oregon-based IP Fabrics Inc., a world leader in Deep Packet Inspection (DPI) technologies. IP Fabrics was a privately held company that offered network visibility, compliance, and analytics solutions to network operators, enterprise, and government agencies. IP Fabrics leverages core competencies in multicore software development, deep packet inspection, network application decoding, and advanced analytics to provide solutions that produce actionable intelligence useful for network and business planning, regulatory compliance, security, network forensics and monetization. Raj Puri, CEO, states “I have personally known IP Fabrics now over a decade and always thought they had great technology and expertise. The acquisition included all the Intellectual Property in strategic technologies that IP Fabrics owns in its impressive product portfolio, global Customer base, IP Fabrics Team, and Oregon offices and related assets.” IPF brings over 45 customers with deployed IPF products. Yaana is currently in the transition process to integrate the companies and has already started to work on the joint product roadmap to focus on some near-term opportunities and plan out some mid to long-term directions. Together, Yaana and IP Fabrics will meet a wider set of customer needs by integrating products, technologies and services. The combined companies have significant opportunity to grow into new markets, particularly around broadband providers. IP Fabrics supplies network traffic visibility, inspection, forensics, and analytics solutions to communications service provider and enterprise IT markets. 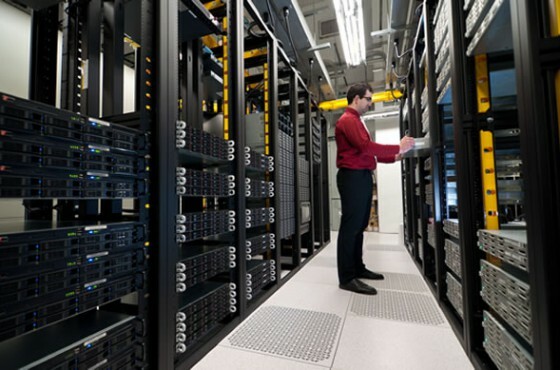 We leverage core competencies in multicore software development, deep packet inspection, application decoding, filtering, and advanced analytics to provide solutions that produce actionable intelligence useful for network and business planning, regulatory compliance, network forensics, and business intelligence.